Abstract: Computer Assisted Structure Elucidation (CASE) first appeared in literature almost 50 years ago. But it was only in the past 20 years that it has gained actual traction, mostly due to advancements in computing power that enabled the researcher to handle the vast amount of data processing . CASE allows for the rapid generation of structures that are in agreement with signals observed in 1D and 2D NMR correlation spectroscopy (HSQC, HMBC, COSY etc. ), followed by ranking and selection of the ones that agree more with observed chemical shifts. In addition to the obvious benefit of reduced time to solve a structure, CASE also offers the advantages of complete non-bias that may otherwise be present with any pre-conceptions that are associated with the elucidation process. In this presentation we review a variety of almost 60 structures that were solved as part of an Elucidation of the Month column. We present details on the types of structures solved, their sizes (number of heavy atoms), proton content, elucidation time and the confidence level on the validity of the proposed structure. 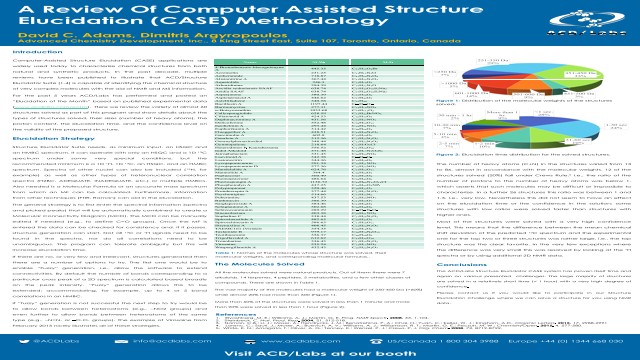 Summary: Here we review the variety of almost 60 structures solved using CASE and the ACD/Structure Elucidator Workbook Suite. We show details about the types of structures solved, their sizes (number of heavy atoms), the proton content, the elucidation time, and the confidence level on the validity of the proposed structure. References: Elyashberg, M. E.; Williams, A. J.; Martin, G. E. Prog. NMR Spectr. 2008, 53, 1-104. 2. Steinbeck, C. Nat. Prod. Rep. 2004, 21, 512-518. 4. Lorenc, C.; Sauri, J.; Moser, A.; Buevich, A. V.; Williams, A. J.; Williamson, R. T.; Martin, G. E.; Peczuh, M. W.; ChemistryOpen, 2015, 4, 577-580. 5. White, K. N.; Amagata, T.; Oliver, A. G.; Tenney, K.; Wenzel, P. J.; Crews, P. J. Org. Chem. 2008, 73, 8719-8722.